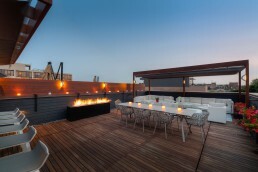 Set atop a private residential building in the heart of downtown Toronto sits a prestigious penthouse patio. 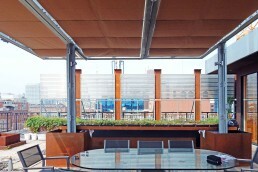 While the existing patio had spectacular panoramic views of the city skyline, it was underutilized and lacked much-needed protection from the elements. To address these challenges and transform the space, the owners brought in nationally-renowned NAK Design Strategies, a firm known for their creativity, boldness and premier deployments. True to form, NAK’s urban jungle design was bold, prominent and merged modern industrial development into a living residential environment. Green shrubs and trees encapsulate the patio, as river rocks and concrete pavers are dispersed throughout. Rustic steel planters and accessories are utilized in the dining area while the 13 ft galvanized post and beam structure completes the industrial vintage look. 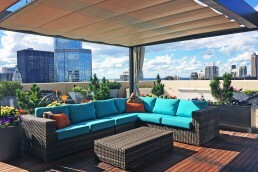 Heaters and lights are scattered throughout the area while privacy screens are used to enhance the discretion of the space. ShadeFX worked with NAK Design Strategies to manufacture and install custom canopies into their architecturally designed structure. 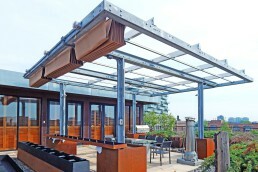 Three side-by-side, 23′ x 8′ motorized canopies were built utilizing water-resistant Sunbrella fabric. 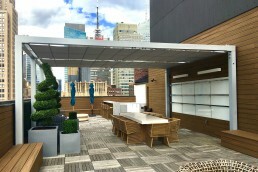 The beige canopy fabric seamlessly complemented the rustic accents that ran throughout the space and provided the dining areas with much-needed protection from the sun and rain. ShadeFX worked with NAK Design Strategies to manufacture and install custom canopies into their architecturally designed structure. 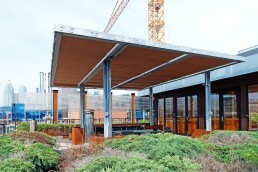 Three side-by-side, 23′ x 8′ motorized canopies were built utilizing water resistant Sunbrella fabric. The beige canopy fabric seamlessly complimented the rustic accents that ran through out the space and provided the dining areas with much needed protection from the sun and rain.